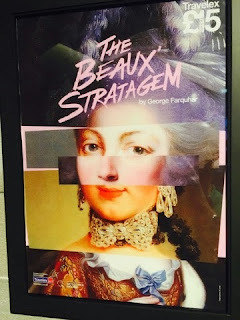 Last night Stuart and I went to see George Farquhar's wonderful play The Beaux' Stratagem at the Olivier Theatre on London's glitzy South Bank. This was our third Restoration comedy in as many weeks - and the funniest by far. The humour was rich, clever and bawdy. The actors played and sang not only to each other but also to the crowd. And the production rollicked along and getting the tempo just right. Part-farce, part-comedy of manners the story tells of Archer and Aimwell, two young gentlemen, who have fallen on hard times, who plan to travel through small towns, entrap young heiresses, stealing their money and moving on. In the first town, Lichfield, they set their sights on Dorinda. Aimwell falls truly in love, and comedy ensues. And for extra comedic value Foigard, a priest and chaplain to the French officer, is actually an Irish priest called MacShane. The two beaux are played superbly by Samual Barnett (yes, him off of History Boys and Beautiful People) and Geoffrey Streatfeild (yes, him off of The Other Boleyn Girl and The Thick Of It). Their respective female foils are Mrs Sullen played magnificently by Susannah Fielding (yes, her off of Almeida Theatre's American Psycho and Doctor Who's Victory of the Daleks) and Dorinda played coquettishly by Pippa Bennett-Warner (yes, her off of Doctor Who's Time Heist). The National doing what it does best.. Entertaining - top-notchly.